Hi, I was making Rosworth HQ into Multiplayer with interactive industries, I figured that I'd do this because it's a more linear route than Rosworth Vale SP2. I was just wondering, many of these multiplayer sessions aren't really equipped with features to set junctions for the mainline or your intended direction to make going from place to place a little bit easier than constantly leaving your train to switch the points. Another aspect I've been researching, was implementing AI on multiplayer by default, meaning the portals would be active and players would have to work with AI, I felt the interlocking towers would aid as an equaliser in players working with the AI, instead of competing against the players for the same track space, not to mention I have tactics to keep the AI on the straight and narrow including track priorities. So I did a little bit of digging and found the Interlocking Tower assets (more specifically, the Crowcombe-Heathfield Signal Box, I also found an invisible equivalent), so I tried implementing them at the various signal boxes placed along the route and tried them out. So yeah, when I drive up to the junction ahead, it gives me a list of platforms I can go into, which is as intended, although since I assume tech like this hasn't been implemented in any MP session, I'm not entirely sure how this would work out, I assume everything's fine since it works with the player driving the train. One curious thing is the fact that the entrance signals are always red until I select a path, and the path is locked. It It doesn't matter as much since the yard is not placed on the mainline and shunting movements aren't hard to do. But when it comes to yards on the route which are far less predictable then what you'd see at Lowfell, for example: Highcraggs, things become muddier. The reason I say this is because when doing shunting maneuvres, these maneuvres may include going onto the mainline and therefore, locking the junctions in a certain direction during shunting maneuvres is not advised. I'm not entirely sure if there's anything that I can entirely do to solve this shunting issue, and if so, I wonder how I can do it in as much of a flexible manner as possible, possible rules are appreciated. Last edited by Ben1337; August 3rd, 2018 at 07:05 PM. If a signal is controlled by an EIT the signal will be red at all times unless a path is activated (much like real life), except for long stretches of mainline, keep those signals automatic (again like in real life), only have paths from signals protecting junctions where you have multiple routes. It can be a headache having to make a path for every single possible route, especially in yards. But I think you may get away with it with some experimentation, leaving yards without paths for example, and only having the entrance and exit pathed. I'd have a path leading into the yard and one out but leave the yards without an EIT. If a player has to do a shunt that requires entering the mainline they will have to use a path, then another path to get back into the yard. If you set your paths up in a good way, where they start and end at the right point, I can't see why it wouldn't work. I use EIT's extensively in my own layout, but don't use multiplayer so I can't help regarding that. Can you give me some examples of how they're used in your layouts? Difficult to answer and explain a question that broad! I'll give a little run down of the basics. I have towers for different areas and for areas that would end up having lots of paths I separate them. For example a long yard will have a tower controlling the north and a different tower controlling the south end of the yard. Works fine as long as you know the limits of each tower as it'll start breaking if a signal is controlled by two towers. If you were in the yard and exiting a siding, you'd come across signal B, which would have two path options.. one be back onto the mainline (in the opposite direction) and the second would be into the headshunt/spur. If you were shunting you'd choose the headshunt path and if you were exiting the yard you'd choose the other one. The rest of the yard could be unsignalled. The only signals that would be on a tower would be the one exiting the yard. I struggle to explain these things. I might make an example, as I tried to draw it but that came out messy! I've clicked show all paths so you can see the paths don't actually go into the yard proper and just get you into the 'throat' of the yard if you like.. The signal on the left takes you along the mainline OR can take you into the yard, from then you can manually change junctions to whatever road you like. When leaving the yard you'll get the path dialogue for the signal between Junction 6 and 4... That will ask you if you want to go onto the mainline, or into the headshunt. (I haven't set up the mainline one but it would go out and across junction 10 and 12. Does the above help at all? Shunting movements onto the mainline would have to be controlled by signals. IRL if you were shunting onto the main you would be signalled and in a lot of cases travel on the wrong line in the wrong direction (this is why Limit of Shunt signs/signals exist). If your mainline routes are controlled by paths what is your issue with having movements in and out of a yard controlled by paths? It would work without problems and ensure you don't end up coming face to face with a mainline train. Last edited by Davie_UCF; August 4th, 2018 at 11:03 AM. I hope this is what you mean.. or similar. If you were a train in the loop and you wanted to run around your train you need to use the mainline. So you'd get the path from A to B which i've badly drawn in RED. As you're then travelling in the wrong direction on the mainline there would be a limit of shunt signal or sign at C (or off screen depending on train length). Once you've got to beyond the signal at B, you would get the choice of paths back into the loop or along the mainline (Yellow) to the other end of the loop (where you'd have similar paths set up). You could also have the option of leaving the yard with the path from A - D (Green). As the path ends at D, you could also shunt using this and sit beyond D, change direction and get a path back into the loop or crossover onto the yellow line. Yeah, what I meant by having a look, I just wanted to see how you did it on some sample routes and see how they worked. But yeah, that's how I did it and the movements seemed complicated, espechially when doing things like accessing the the trap points at the end of the half loop. Also jsut for reference, trains form left to right are on the up line and trains from right to left are on the down line. I'll show you what I had set up. Last edited by Ben1337; August 4th, 2018 at 11:34 AM. It will seem complicated if you look at the list of paths, but remember when you're driving you only see the paths you can get to. Here's some of the paths from a tower controlling the north of a yard, you can see there's loads as they don't even fit in the window without scrolling. That's a 11 road yard that's signalled on each road though, so that doesn't help. So the paths are designed to clear a destination between the various signals, I guess the onyl thing missing is an addtinoal reversal path to the up end of the loop. Though having said that, the addition of a "limit of shunt" is defintiely interesting, like it gets treated as a signal, I'm not to sure how AI would treat it though due to the fact that in order to reserve a path like that, you'd need to set the signal before the limit of shunt to red. Edit: Yeah, it's not only the fact that it allows you to see the paths from that direction, it also removes the options to go where only AI can go as well by setting the assignment options to automatic (AI-only). Last edited by Ben1337; August 4th, 2018 at 12:04 PM. The limit of shunt won't really affect AI as they shouldn't be passing it anyway. Also you don't really need it as the paths will work fine without but it's a realism thing. It's only there because trains aren't meant to travel along the mainline in the wrong direction and are only doing that so they can reverse back into the loop or onto the other mainline. Depends if you want it to feel realistic and believable. The limit of shunt could just be a sign or a signal that's a special LOS signal, I believe there's some available for trainz. Can you rephrase your comment regarding your issues with the black path and signals? The black paths refer to paths that just clear the signal for sections of the line which wouldn't otherwise be accessible because the signal would be red. Also the lmit of shunt is defintiely interesting, because once a shunting path has been activated, it would force the previous signal before the limit of shunt to turn red, forcing mainline locomtovies to stop, I guess. The way I look at it is like real life. 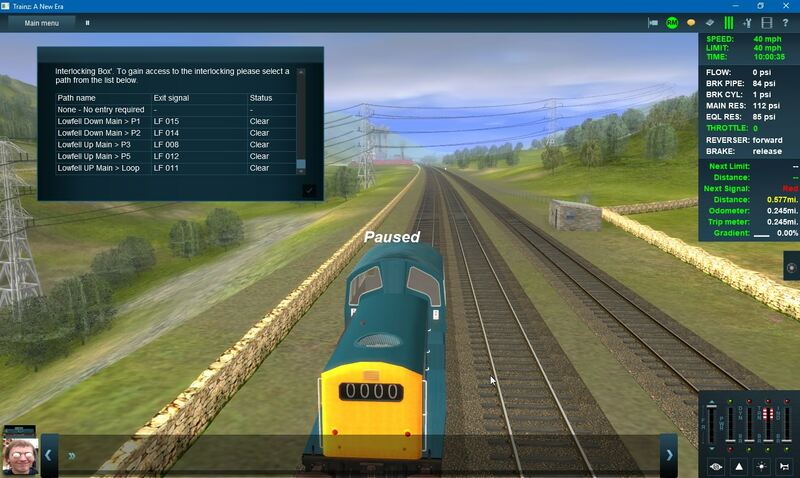 Some signals are automatic and are on straight sections of track... Much like how signals in trainz without towers. Other signals are controlled by boxes, these are the ones protecting junctions with multiple routes and are always at danger until a signaller sets a path. 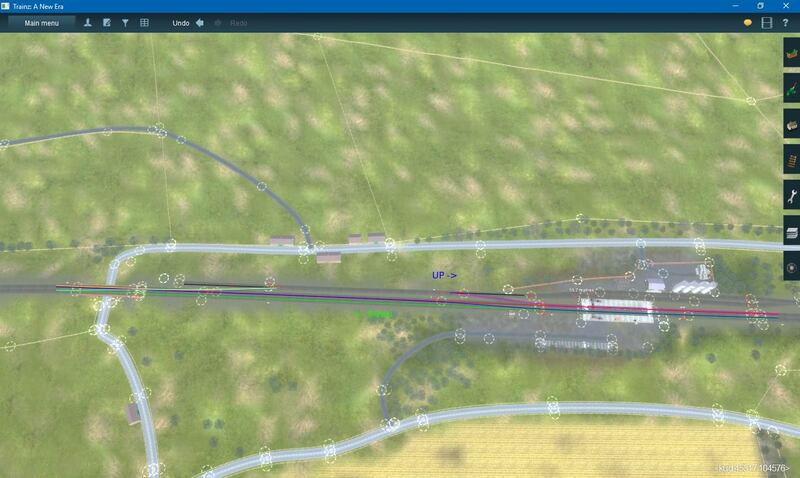 So in trainz if a signal had paths set up it needs paths for every move you want to make, even straight across. Otherwise you'll end up with conflicts or signals going back on drivers (from green/yellow to red which is not allowed IRL and only happens if there's a major fault). Another note. Have you tried changing the towers ownership from 'static' to 'dynamic'? That means points aren't locked (I'm not sure if it affects the signals?). I steer from this because of the conflict and signal issue I mentioned above. Yeah the limit of shunt would work well. Depends which mainline you want to shunt onto. The one with the limit of shunt would work better as you'd go beyond the mainline signal which would take you back into the yard. Saves having another signal installed on the other line (although that would just be a position light). Hope some of this helps as I can offer insight into realistic/believable signal operations as I'm a driver in the UK. But there are a couple of places where I kept the signal interlocks, and one's at Lowfell, the other's at Sandsworth, to allow the player to choose which way they'd like to go.